From a bespoke promotional gift to a useful item that will stay with a customer for years, promotional umbrellas offer everything you’d want from a marketing product. 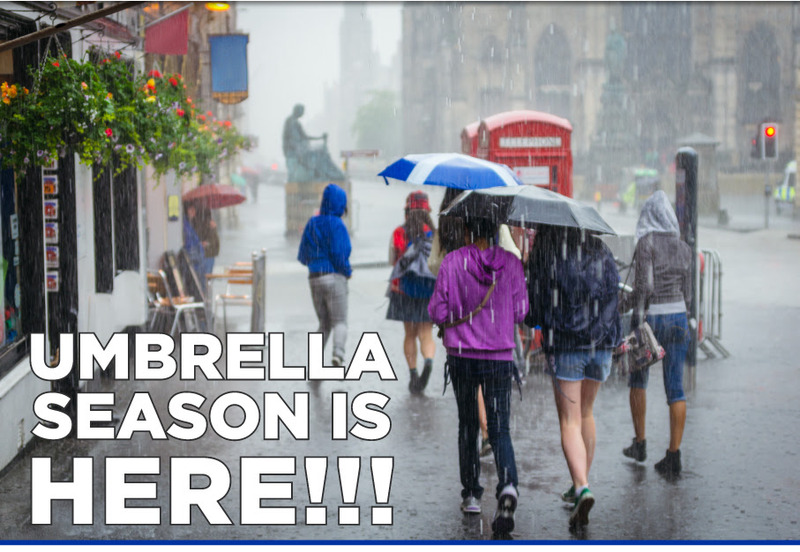 When you consider that on average it rains 147 days a year in the UK, umbrellas will likely be advertising your brand or products months after the initial event due to the British weather! This means umbrellas boast the lowest cost per impression of any promotional item currently on the market. With a branded umbrella, you aren’t just advertising to the recipient, you’re actually targeting their friends, family, colleagues and anybody else they just happen to pass in the street whilst it’s raining. And if you take a look outside, chances are they happen to be pretty helpful to have to hand all year round. Promo umbrellas are great for so many customer bases too, for example we offer golf, walking, outdoor parasols and telescopic umbrellas to name a few, so are suitable for many different occasions. Branded brollies really are the king of useful promotional merchandise. We’re now also offering branded Eco umbrellas that have canopies made from recycled plastic bottles, which cuts the amount of waste going to landfill and, overall, reduces the ecological footprint of the umbrella. The 100% recycled PET vented canopy is super stabilised for windy conditions, has an automated function for quicker opening, a strong but lightweight fibreglass stem and an ergonomic black rubber coated handle for ease of use. It’s easy to see how a branded Eco umbrella promotes your brand, does good for the environment, and doesn’t compromise on quality. Approximately 5 x 500ml bottles are needed to create each Eco umbrella canopy. Used plastic bottles are collected from a recycling plant, then broken down into tiny flakes, which are then cleaned, dried and heated to form a molten liquid. This molten plastic is then stretched out to become lengths of thread, which are transformed into material which is then cut into panels and sewn together to create the umbrella canopy. Our branded umbrellas boast over 50 panel colours, stitching and binding colours so we’ve got you covered no matter your logo or theme. Large print areas of an excess of 300mm mean there’s no chance of missing your brand. Plus they offer huge exposure of your brand in crowds, at sporting events and at corporate occasions. Rain is pretty much guaranteed all year in the UK these days so you can imagine using an umbrella daily is a good investment, costing from just 4p per use. With a stormproof umbrella, even if it blows inside out our fibreglass ribs let you use your brolly over and over. Get in touch if you’re interested in hearing more about branded umbrellas or if you’ve got a success story of using brollies for promotion.